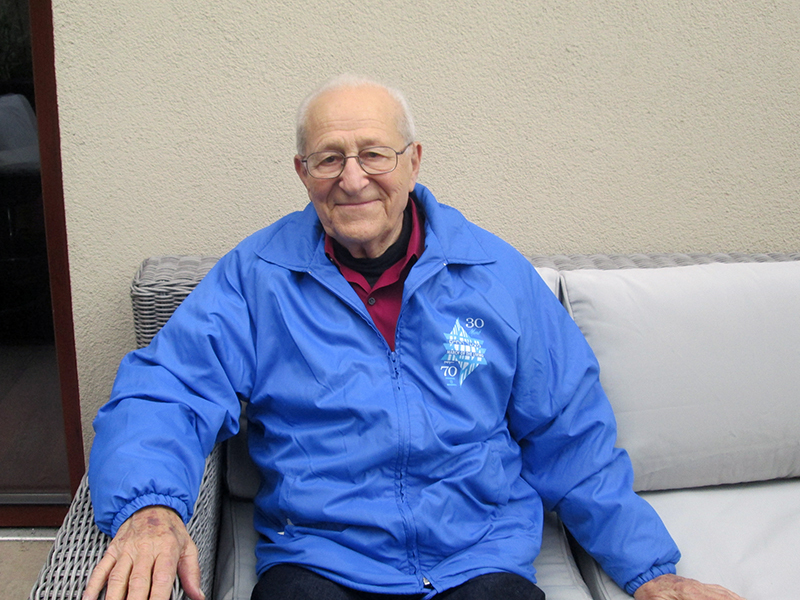 OSWIECIM, Poland (RNS) — Seventy-three years ago this week Irving Roth, 88, was liberated from the Buchenwald concentration camp. He and his brother had been imprisoned in the Auschwitz death camp, but as Allied troops approached, the boys were sent on a death march to Buchenwald — where his brother died. On Thursday (April 12), Roth, of Long Island, N.Y., returned to Auschwitz — now a memorial and museum — for the “seventh or eighth” time since his liberation. He was one of 70 Holocaust survivors who participated in this year’s March of the Living, a 30-year-old international educational Holocaust program that begins with a week of study and visits to Jewish and Holocaust sites and culminates with a two-mile march from Auschwitz to Birkenau and an emotion-filled ceremony of remembrance. At Auschwitz, first-time participants gasped when they saw the piles of shoes, hairbrushes, toothbrushes, leg braces, limb prosthetics and cooking pots those who were sent to the camp brought with them. Tovah Brandwein from Delray Beach, Fla., turned 18 on the day of the march. In her hand she held a list of her relatives who were murdered in the Holocaust. AW COME ON. “There are still hundreds of millions of people who want the Jewish people to disappear”?! Then by golly DECLARE WAR ON THOSE 100,000,000s AND DISAPPEAR THEM ALL before they disappear you all! The so called “death march” was a voluntary evacuation. Like everything called a “death march”. Now I can tell my great Uncle Morris that his immediate family weren’t really murdered en masse. That they just moved east and just never left a forwarding address. He will be so pleased to hear that! Elie Wiesel said prisoners were given the choice to evacuate. Primo Levi also describes about his choosing to say and other prisoners choosing to leave. Wiesel described a death march in his 1958 book Night from Buna to Buchenwald. -Eliezer’s friend Zalman gets a stomach cramp. trampled to death by all the prisoners. -The road seems endless, but finally (after many hours) they are at last ordered to rest. Eliezer’s father directs him to a shed to sleep in. asleep—it’s dangerous to sleep in the snow. To sleep means death. Primo Levi never was on such a march. The only people who make your claim are lying holocaust deniers. The ones whose work went up in smoke when David Irving admitted to lying and wholesale fabrication. It’s Wiesel’s and Levis own words. Levi wasn’t on the march because he chose to stay behind. He talks about two Hungarian boys who were “afraid to stay” and said he probably would have left to but he felt weak. Evidently not. Since their own words in their own books said otherwise. As I already demonstrated. You are dishonestly adding in “chose to stay”. He was left behind because they couldn’t move him and weren’t expecting him to live. Again, I would love to see where you get these assertions from. Not the Primo Levi one, but that death marches weren’t so. Both Weisel and Levi describe the evacuation as a choice. You’re calling them liars. The Night Trilogy: Night, Dawn, Day By Elie Wiesel, p. 100. Survival In Auschwitz By Primo Levi, p. 154. No, I am calling YOU a liar. You are fabricating things about those two authors. Especially given my prior citation to their works directly contradicts your assertions. You obviously cribbed from a Holocaust denial site and are too spineless to link to it. Holocaust denying liars are the only people who make assertions such as yours. I quoted their own words and cited page numbers from books they wrote. You’re saying Weisel and Levi are holocaust deniers. You gave me a flat out lie that you obviously cribbed from another source online. Those works do not support your claim. Their words do not support your claim. I am saying YOU ARE a holocaust denier. One who is lying about Wiesel and Levi. The Holocaust is a well trodden subject with a lot of websites concerning its history down to the minute detail. Why are you so afraid to link to one which supports your claim? By all means prove me wrong here with an online source. One which refutes they were death marches. I directly quoted their books and provided you the page numbers. You’re a reality denier. No you didn’t. You are a liar and a very poor one at that. Their works said nothing of the type. I proved my point with various sources which demonstrated you were lying. You are merely a using a tactic which was old hat even back in the early days of the internet. No online source to back your claim up? With all the material written about the Holocaust and those two authors. How very interesting. When have you stopped lying? Direct quote from Weisel: “the choice [to evacuate] was in our hands…we could decide our fate for once”. You can’t read and you deny reality. You are cutting and pasting from where (online site)? That is a rather big ellipsis and parenthesized area on the Wiesel quote. Ones that can easily change the meaning of the quote. The Levi quote does not indicate the march was voluntary either. I don’t believe those are direct quotes at all. Nor do I believe you have either book in front of you to make those quotes. Nor do I have to take your word on that either. One thing I have already demonstrated in various sources is: BOTH AUTHORS DESCRIBED IT AS DEATH MARCHES IN THEIR WORKS. YOU ARE LYING ABOUT WHAT THEY SAID AND MEANT. Again, the lack of online citation only makes you look more dishonest. Again the only people who make your claim are Holocaust denial liars. A rather small ellipsis, the omitted words were “For once.” Both books can be previewed on Google Books, reality denier, go do it. You don’t believe those are direct quotes because you can’t read, similar to how you can’t read a Supreme Court decision. Its funny how neither author supported your view in their works as I had demonstrated several times already in various quotes, and sources referencing either book as literary works. Two edited and out of context quotes (if even genuine, something not established) pale in comparison. No historian supports it. No historical source one can find online does either. You are full of crap. Because you didn’t quote them. You are a liar. You cribbed an idea from a Holocaust denial site and are trying to cover it up with the lamest tactic they have, pretending to quote a book. Its what bullcrap artists do in online discussions. You are calling Levi and Weisel liars. It’s funny how you can’t read. I gave you direct quotes and page numbers. You can’t handle the truth, reality denier. Not at all. Since you are not quoting them. You can’t attribute those “direct quotes and page numbers” to anything which can be verified online. Yet I have attributed several sources online which say those authors said something completely different. One from Wiesel himself describing a death march in detail. Funny how that works. The only conclusion to be made is you are a liar. Now that you have beaten the “I am pretending to make book citations of authors, but not really” argument to death, do you have any online source to verify your initial claim? Historians, testimony, anything? If something is so plainly verifiable historical record of one of the most chronicled subjects out there, why can’t you find a single online source to verify your claims? You believe “sources online”, and not Levi and Wiesel’s own words. As stated before, both Night and Survival in Auschwitz can be previewed on Google books. Stop whining and go do that. Because you have not quoted them in a credible fashion. I believe sources I can verify, you have balked at any attempt to verify yours. Because you are full of crap. Liars don’t like to have their sources verified. The approximately 850 patients who were not up to the impending march were left behind in the Buna/Monowitz concentration camp. The few who survived the following days with no support of any kind were freed by the Red Army on January 27, 1945.
imprisonment and disease, despite medical care provided by Red Army doctors and nurses. Nowhere will you find anything concerning the march or even staying being voluntary. You added that part and deliberately quotemined (assuming the entire quote wasn’t fabricated). There is no other conclusion other than you are a lying sack of crap*. *BTW it was pretty clear you were quoting a specific Holocaust denial site, but I was not going to post a link to such garbage. You find it in accounts by Elie Weisel and Primo Levi. I already did. You lied about what they said. We established that already. Do you have an online source to verify you aren’t a lying sack of turds? The quotes are completely accurate. Your inability to verify them is making me laugh. Maybe you should ask someone to help you. Because you said so? Not even close to credible. I don’t have to verify your claims. I already demonstrated your assertions were false. That you were lying about them. But in general, if I was repeatedly called a liar for not providing some online verification of my claims, I would make some effort to find a source to give as a link to support them. Assuming I was looking to refute such accusations. You clearly are not. You have no problem being called a liar. Fine by me. Your capitulation is duly noted. If I were given direct quotes I thought were wrong I would spend two seconds looking them up, instead of screeching and whining and calling names, but that’s just me. Maybe you don’t know how to use the internet? You should ask a friend or family member or maybe your special ed teacher to help you. But you didn’t give direct quotes at all. You are a liar. Plain and simple. Your word isn’t worth squat. I already had a plethora of verifiable sources which said you were full of crap. You simply went with the “nyah huh defense”. You have made it clear you have no desire to act in a credible manner. I guess you didn’t mind being called a liar then. You are done. I literally gave direct quotes, not that you care. Have you asked a friend to help you look them up yet, or do you not have any friends? Clearly you don’t mind being laughed at. No you didn’t. You lied. Very badly and obviously. Quote mining is so old school and transparent. Only idiots and compulsive liars use it. Like you. I refuted your premise entirely several times over with the same people you pretended to, but didn’t, quote. You have brought nothing to the table to show you are being truthful here. You lost. Liar liar pants on fire. Calling direct quotes “lies” is laughably dumb, but then so is your inability to verify them. It would only be dumb if you can prove online in a credible manner they are direct quotes. But I already verified them a while ago. You were lying the entire time. You blinked already when your veracity was challenged. You provided no link because you were cutting and pasting from a site which was obvious holocaust denial garbage. You lost. Bye bye troll garbage. Your inability to verify direct quotes from books is funny, the way you keep going on about it is mentally ill. I verified them already. You lied. Those weren’t real quotes. Your citations were phony. Your quotes are fabricated. Prove me wrong here with an online source and link. Especially one claiming the death marches didn’t occur. Should be simple to people who aren’t liars. It’s really weird you would lie and say you verified them instead of actually verifying them. You’re more mentally ill than I thought. But I did. You are a liar. You’re a loser. We both know you didn’t because you couldn’t find anyone to help you. Sad. No we don’t. Because we both know your quotes were fake and you are too spineless and dishonest to ever try to prove me wrong. Like with an online source to corroborate your claim. How does it feel to he such a sore loser? The quotes are 100% accurate, which you would know if you weren’t too stupid to verify them. Because you said so. But your wrong. They aren’t. I verified you were lying. You are too scared, stupid, dishonest, to ever show me up here. Poor Holocaust Denying Loser.